Crowne Plaza Resort Hotel & Golf Club Lake Placid has the most spectacular views of any hotel in the region. 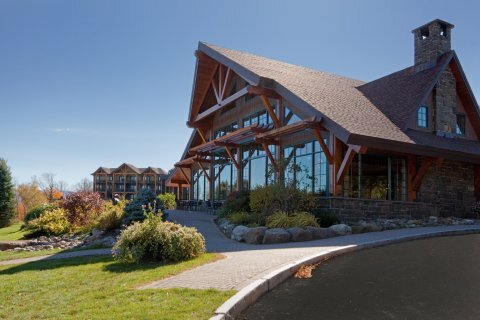 Located in the center of the village of Lake Placid, overlooking the lake and Whiteface Mountain, this full-service resort and conference facility has an unmatched range of amenities, including free high speed wireless Internet access in all guest rooms and lobby, indoor swimming pool, hot tub, and fitness room. All hotel rooms are nonsmoking, featuring the Crowne Plaza Sleep Advantage program and have refrigerators and microwaves & coffee makers. Inquire about our suites, chalets, (some with kitchens, Jacuzzis & fireplaces), private homes and condos. The Great Room Lobby & Bar towers above the town and boasts an unsurpassed view & Adirondack charm that is second to none -the perfect spot to relax in front of the Grand Fireplace. The Crowne Plaza Resort and Golf Club Lake Placid offers diverse dining options in our 4 restaurants (some seasonal). Dine at the Boat House Restaurant on the shores of Mirror Lake, Veranda Restaurant overlooking the lake & mountains, the Golf House Restaurant or in the main hotel. 45 holes of championship golf at the Lake Placid Club, tennis courts, private beach & 25km of x-country ski and snowshoe trails make the Crowne Plaza Resort & Golf Club the biggest and best resort in the Lake Placid. Pet friendly hotel. This hotel is committed to providing accessible facilities under the American Disabilities Act. If your accessibility needs are not met, please contact the Hotel Manager on Duty. Should you require additional information regarding accessible facilities for guests with disabilities, please call 1-800-Holiday (U.S. and Canada) or contact the hotel directly. For the hearing impaired, TDD service is available at 1-800-238-5544 within the U.S. and Canada.